In other words, God doesn’t put a limitation to our forgiveness of others. But where did Jesus come up with the number, “70 times 7”? It wasn’t done arbitrarily by Jesus but actually done intentionally. In order to understand the reason why Jesus used that particular number, a look into the Old Testament book of Genesis will provide an answer. In Genesis, chapter 4, we read of Cain, one of two sons of Adam and Eve, who displeased God by offering up fruits of his labor from his garden instead of a blood sacrifice of an animal as did his brother, Abel. Jealous of the favor God had shown Abel, Cain killed his brother. Cain was charged by God of murdering his brother and sentenced to live a life wandering the earth and unable to produce fruits from the earth as he once did. Cain admitted it was worse than death and more than he could bear. Now, fast forward 6 generations to Cain’s great-great-great-great-great-great-grandson, Lamech. Lamech was a rebel, to say the least. He was the world’s first polygamist by having two wives. Like his grandfather Cain, he was also a murderer. Lamech never forgot how God punished his grandfather and told his two wives, ” . . . . hear my voice; listen to me, you wives of Lamech. I have killed a man who attacked me, a young man who wounded me. If someone who kills Cain is punished seven times, then the one who kills me will be punished seventy-seven times!” (Genesis 4:23-24 (NLT). So there we find the number that Jesus used, 70 times 7. Jesus referred to Lamech’s comment of vengeance upon others as being the epitome of evil. 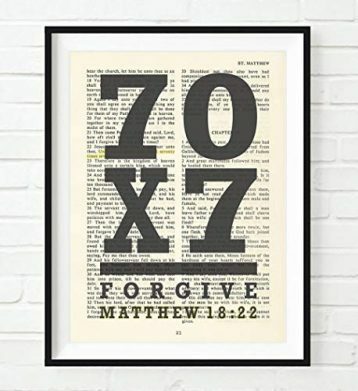 However, Jesus declared to Peter that we should forgive others 70 times 7, thereby nullifying Lamech’s declaration of evilness, leading to murder, and instead, demonstrating the epitome of love and forgiveness by using the same number. Forgiveness of others is essential to our prayers being answered and even to our own forgiveness by the Lord. So begin the New Year with a forgiving heart towards everyone and in your forgiving, also forget past offenses, just as the Lord has done for you and may all of your prayers be answered.